The stormy 1904 election ended with Santa Rosa's two newspaper editors locked in intransigent battle, each fighting the good fight right to the bell. 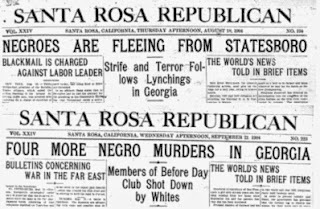 But the next morning a surrender was announced; the Press Democrat crowed that the rival Santa Rosa Republican was being sold post haste. Today Allen B. Lemmon and his Santa Rosa Republican are footnotes as the town's "other"newspaper and its editor. Even intrepid genealogists rarely check its archives, obvious because Press Democrat microfilms always have far more scratches and other signs of wear; SSU's reel for the latter months of 1904 was even unopened until this project began. The Republican deserves more respect from the history books. It provided an important counterbalance to the conservative Press Democrat (see posts on the 1904 elections) and stayed true to its party-of-Lincoln roots by keeping Southern lynchings and other racial violence at the forefront. It also provides a much-needed way to verify the accuracy of the PD's reporting; even in the small sample of 1904 items examined here, a case was found where the Press Democrat omitted a key detail that changed the story entirely. While its reporting and writing were always first-rate, the Republican was looking a little frayed at the cuffs by 1904. Ad revenue was clearly down; sometimes a two-column hole would appear -- on the front page, no less -- reading only, "This space reserved for" (a local merchant whose ad would appear up to several days later). Lemmon regularly filled space by inserting over-sized advertisements to sell building lots in his own "La Rosa Place" subdivision, apparently between modern-day Juilliard Park and the highway 101/12 intersection. And at least twice, the recurring slot for "Cremo" cigars presented hand-written copy, probably scribbled at the last minute when the expected ad art didn't arrive in time. As the example here shows, a copy writer Lemmon wasn't. Lemmon certainly deserved a rest. Besides editing the Republican and peddling real estate (available on the installment plan for $10/mo), he was also the town's postmaster. It must of been a wrenching change on the morning of November 11 to awake and realize that he only had two full-time jobs demanding his attention that day, then later that evening opening "his" paper to find other names on the masthead for the first time since 1887. 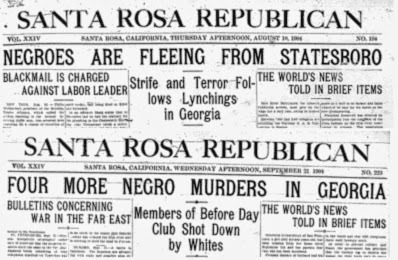 For some time there have been persistent rumors to the effect that the Santa Rosa Republican has been purchased by Mr. James, business manager of the Sacramento Bee and W.B. Reynolds of the Oakland Enquirer., and that the ownership would pass into their hands after the election, or about the twentieth of November. Last night, Mr. Lemmon was seen by a reporter in regard to the matter. "There is a story afloat, Mr. Lemmon, that you have sold the Republican. What have you to say?" "The Republican is not sold," declared Mr. Lemmon emphatically, "there have been a number of stories told regarding the matter but I own the Republican and may own it forever. I have not sold the Republican." It is understood as stated above, that the agreement to sell takes effect at the date mentioned, and as Mr. Lemmon says the paper may not technically be sold at the present time but the formal transfer will soon be made. Mr. James is now in this city but could not be seen last night. Today the management of the Republican passes into new hands. Mr. W. H. James and Mr. W. B. Reynolds have leased the paper, and, under the agreeement entered into, may eventually own the same. Both are practical printers and young men of ability and extended newspaper experience. For several years Mr. James has held a responsible position on the Sacramento Bee and Mr. Reynolds has been similarly connected with the Oakland Enquirer. They should prove a very strong newspaper team and we commend them to the many good friends of this paper. For nearly seventeen years the writer has been responsible for the editorial and business management of the Republican. He is a bit tired and has considerable other business to attend to. Hence the change.